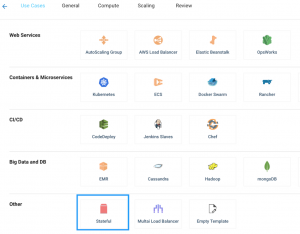 Spotinst allows you to import any instance from an AWS account to a stateful Spot instance managed by Elastigroup. The Spot instance will have the same state as the original instance, this includes the root and data volumes and (optionally) the private IP of the original instance. Head to the Creation Wizard and in the Use Cases tab select Stateful. In the window select the Region and enter the instance Id of the instance to import. Using the same Private IP as the original instance requires the original instance to be terminated. The termination can be done automatically with the launch of the Elastigroup. If automatic termination isn’t activated a prompt is presented during the Elastigroup initialization requesting to terminate the original instance in order to proceed. 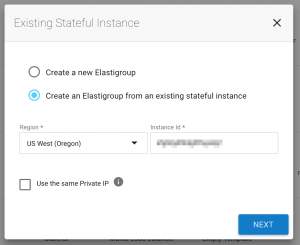 See the Stateful Actions Menu to manage the state of the new stateful instance on Elastigroup.